Amongst the varied, diverse causes of intraabdominal masses in infancy and early childhood, gastric teratomas (GTs) account for a very small proportion. A worldwide literature search reveals only around one hundred cases of GT and also supports the fact that its preoperative diagnosis remains elusive. Here we report the case of a two-month-old male who presented to the pediatric surgery outpatient department of Kasturba Medical College and Hospital, Karnataka, India, with progressive distension of abdomen since birth. Clinically, a large firm, non-mobile and non-tender mass involving all four quadrants of the abdomen was seen. Ultrasound revealed a large solid-cystic mass with internal septations extending from the epigastrium up to the pelvis. Computed tomography revealed a large intraperitoneal fat containing solid-cystic mass lesion showing curvilinear and chunky areas of calcification, with the mass focally indenting the posterior gastric wall and showing focal polypoidal intragastric extension. 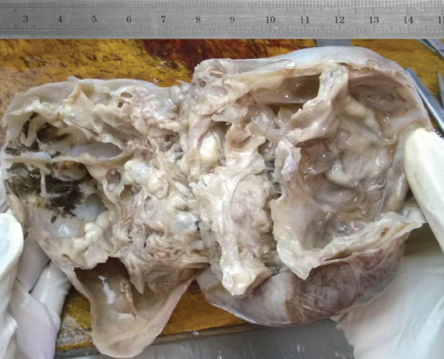 Exploratory laparotomy revealed a large cystic tumor with a solid component, arising from lesser curvature of the stomach, showing focal intraluminal extension across the posterior gastric wall, and occupying the whole lesser sac and abdominal cavity. The tumor was excised in toto along with the body of the stomach. Histopathological examination showed mature tissue derived from all three germ cell layers and confirmed the diagnosis of mature gastric teratoma. The patient was disease free at one-year follow-up. Eustermann and Sentry reported the first case of gastric teratoma (GT) in 1922.3 Around 100 cases have been reported in the literature since.3 However, accurate preoperative diagnosis of this condition has remained elusive due to its rarity. We report this rare case of GT diagnosed preoperatively based on clinical and radiological findings, and confirmed using histopathology. A two-month-old male infant born at full term normal delivery, presented to the pediatric surgery outpatient department of Kasturba Medical College and Hospital, Manipal University, Karnataka, India, with progressively enlarging abdominal mass and distension since birth. On examination, a large firm, non-mobile and non-tender mass involving all four quadrants of the abdomen was seen. There was no history of fever, vomiting, or blood in the stool. All the laboratory investigations including alpha-fetoprotein (AFP) were within normal limits. Ultrasound revealed a large solid-cystic mass with internal septations from the epigastrium extending to the pelvis. A computed tomography (CT) scan revealed a large intraperitoneal fat containing solid-cystic mass lesion measuring 15 × 10 × 8 cm. The mass was lying predominantly on the right side of midline extending across to the left lumbar and iliac fossa region. The mass showed curvilinear and chunky areas of calcification within. Superiorly, the mass was focally indenting the posterior gastric wall, and polypoidal intragastric extension of the mass was seen. Craniocaudally, the mass extended from epigastrium to pelvis. The small bowel loops were displaced to the left lumbar and iliac fossa region. The solid retroperitoneal organs were unremarkable [Figure 1]. Figure 1: CT scan of the abdomen. 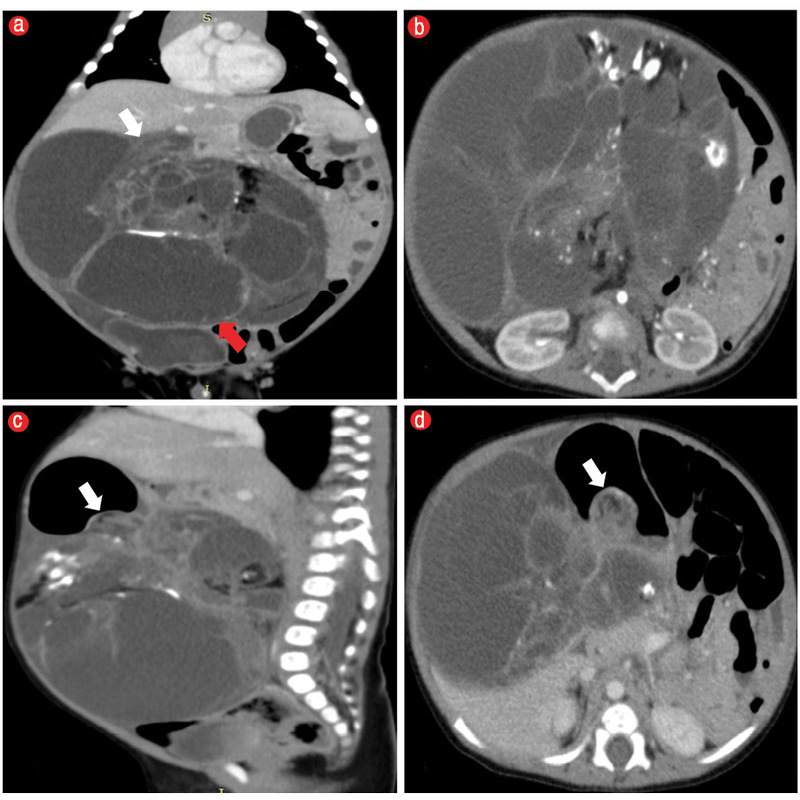 (a) Coronal and (b) axial images revealed a large intraperitoneal solid, cystic mass (red arrow) with intralesional calcification and fat, displacing the small bowel loops to the left side of the midline. (c) Sagittal and (d) axial images revealed a polypoidal intragastric extension of the mass lesion across the posterior wall of the stomach (white arrows). Exploratory laparotomy revealed a large cystic tumor with a solid component arising from lesser curvature of the stomach, showing focal intraluminal extension across the posterior gastric wall and occupying the whole lesser sac and abdominal cavity. The rest of the viscera appeared normal. 17 × 11 × 7 cm. Cut surface revealed large cystic areas filled with gray-white mucoid material and solid gray-brown areas with foci of cartilage and bone [Figure 2]. Figure 2: Cut section showing well-defined solid-cystic mass. Figure 3: Hematoxylin and eosin staining (a) Dental papilla, magnification = 200 ×. (b) Mature glial tissue lined by choroid plexus, magnification = 400 ×. (c) Islands of cartilage (red arrow), ganglion cell clusters (black arrow) surrounded by fibrous and mature glial tissue, magnification = 200 ×. [Figure 3]. The margins were tumor free. The one-year follow-up was uneventful. On CT scan, the described characteristic features of GTs are the presence of fat and calcification in a well-defined solid-cystic mass lesion. However, there have been reports of GTs lacking intralesional fat.8 The exact delineation of its origin from stomach or mesentery can be difficult at times. The multiplanar imaging qualities of multidetector CT scanners is useful in providing better anatomic details. Differentials for a cystic-solid abdominal mass with calcifications in neonates and early infancy include mesoblastic nephroma, neuroblastoma, gastrointestinal stromal tumors, lymphangiomas, and teratomas. CT scan demonstration of normal kidneys effectively rules out mesoblastic nephroblastoma. Neuroblastomas are embryonal malignancies of sympathetic chain, showing calcification in 85% cases and usually present as a solid mass, but in neonates, a cystic variant has been described.6 They usually show liver involvement, while intragastric involvement is rare.6 In the present case, gastric involvement along with the fatty content of the mass, in the absence of liver involvement, ruled out the possibility of neuroblastoma. Gastrointestinal stromal tumors are the most common gastric tumors in children. These are rarely encountered in neonates, usually presenting as a predominantly exogastric mass with focal polypoidal intragastric component with cystic necrosis and infrequent calcifications, but no intralesional fat.9 Rarely, lymphangiomas have calcified walls, but fat has never been documented within them.10 In our case, the presence of fat and calcification in this well-defined mass with evident continuity between the intragastric and large exogastric component clinched the diagnosis in favor of GT. Histopathology confirms the diagnosis and the grades of the teratomas into mature or immature histological types. Mature teratomas are designated grade 0, displaying mature and well-differentiated tissues belonging to all three germinal layers. Immature teratomas contain immature components from one of the germ cell layers most commonly neuroectodermal tissue, and are accordingly graded as 1 if this immature element is present only in one site in a slide, and grades 2 and 3 when present in < 4 and > 4 fields per slide, respectively.7 Our case belonged to the grade 0 mature teratoma group. GT is an exceptionally rare embryonic neoplasm, whose preoperative diagnosis may be challenging, but with recent advances in imaging an accurate diagnosis and staging is possible. GTs have an excellent prognosis if treated promptly and complete surgical excision is usually curative. Schwartz MZ, Shaul DB. Abdominal masses in the newborn. Pediatr Rev 1989 Dec;11(6):172-179. Hanif G. Intra-abdominal tumors in children. J Coll Physicians Surg Pak 2004 Aug;14(8):478-480. Singh M, Rattan KN, Kadian YS, Hasija N. Gastric teratoma: a rare neoplasm. J Neonatal Surg 2012 Apr-Jun;1(2):28. Valenzuela-Ramos MC, Mendizábal-Méndez AL, Ríos-Contreras CA, Rodríguez-Montes CE. Pediatric gastric teratoma. J Radiol Case Rep 2010;4(10):6-13. Göbel U, Calaminus G, Engert J, Kaatsch P, Gadner H, Bökkerink JP, et al. Teratomas in infancy and childhood. Med Pediatr Oncol 1998 Jul;31(1):8-15. Gore MD, Fernbach SK. Case 52: gastric teratoma. Radiology 2002 Nov;225(2):497-499. Sharma A, Arora R, Gupta R, Dinda AK. Immature gastric teratoma in an infant: report of a case and review of the literature. Indian J Pathol Microbiol 2010 Oct-Dec;53(4):868-870. Yoon SE, Goo HW, Jun S, Lee IC, Yoon CH. Immature gastric teratoma in an infant: a case report. Korean J Radiol 2000 Oct-Dec;1(4):226-228. Geramizadeh B, Bahador A, Ganjei-Azar P, Asadi A. Neonatal gastrointestinal stromal tumor. Report of a case and review of literature. J Pediatr Surg 2005 Mar;40(3):572-574. Buccoliero AM, Castiglione F, Maio V, Morelli C, Martin A, Messineo A, et al. Calcified cystic lymphangioma of the mesentery: case report. Fetal Pediatr Pathol 2009;28(5):209-215.